Keren Sung, age 13, Dublin Ohio, won Best of Show for her Green-winged Teal in color pencil which qualified her to compete in the national competition. The judging took place Friday morning March 10, 2017 at the ODCCA show, the official host for the state-wide contest. One-hundred forty-five entries were submitted in Ohio. The national competition was held April 21, 2017 at Charleston Music Hall in Charleston, S.C. A pair of Trumpeter swans painted by Isaac Schreiber, 12, of Duffield, VA, won first place. His design will grace the 2017-2018 Junior Duck Stamp. The $5 stamp is sold to raise funds to educate and engage youth in wildlife and wetlands conservation, and outdoor recreation. Sarah Clayton, 18, from Sidney, Ohio, won Best of Show in the state-level Ohio Junior Duck Stamp competition, March 12, 2016, held at the Ohio Decoy Collectors and Carvers Show, the official host for the contest. Over 160 entries from students K to grade 12 were judged at the show. Sarah began drawing and painting waterfowl and wildlife at a young age. She entered her first Federal Junior Duck Stamp competition in 2005 and has consistently placed well among her peers over that last ten years. And we are proud to say Sarah went on to win second place in the national Federal Junior Duck Stamp Art Contest held at J.N. “Ding” Darling National Wildlife Refuge in Sanibel, Fla, April 22, 2016. Sarah tied for first place and the judges had to re-vote to break the tie. She competed against 27,192 entries submitted from all 50 states, Puerto Rico and the U.S. Virgin Islands. Sarah is a self-taught artist. As a young girl, along with her sister Christine, and her parents, she began attending the ODCCA Shows. They found the annual event to provide inspiration and valuable resources to pursue their eventual careers as professional artists. A colored pencil entry of a pair of snow geese by Stacy Shen, 16, from Fremont, California, won 1st place in the national competition and will be produced on the 2016-2017 pictorial stamp produced by the U.S. Fish and Wildlife Service as part of the Federal Junior Duck Stamp Program. Proceeds from sales of the $5 stamp support environmental education. The Duck Stamp competition is a dynamic art and science-based curriculum that teaches wetland and waterfowl conservation to students in kindergarten through high school. children, parents, art teachers, and school administrators to consider participating at our show 2018 show. A pair of trumpeter swans painted by 12-year-old Isaac Schreiber, Duffield VA., won the 2017-2018 Junior Duck Stamp competition, held in Charleston, S.C., April 21, 2017. Isaac won Best of Show in Virginia which qualified him to compete with children from all 50 states, Washington, D.C., Puerto Rico and the U.S. Virgin Islands. His artwork was made into the 25th Junior Duck Stamp. 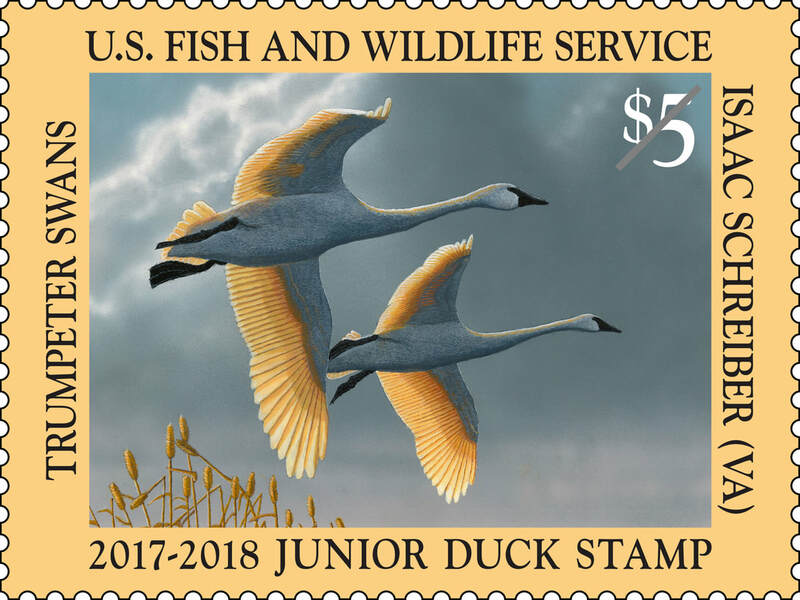 The stamp is sold for $5 and raises funds to educate and engage our nation’s youth in wildlife and wetlands conservation, and outdoor recreation.